FIELD TO VASE was the gala event held in September at Star Valley Flowers. The dinner celebrated the accomplishments of the farm, its owner John Zehrer, the employees and American-grown flowers. POSTED October 5, 2018 10:17 a.m.
CRAWFORD COUNTY - A perfect blue sky and crisp, cool, September air graced Star Valley Flowers in an autumnal golden glow as the more than 200 guests arrived for the ‘Field to Vase’ event held on the farm on Saturday, Sept. 8. The group of attendees assembled included luminaries from the organic and floral industries, and many other local, regional and national movers and shakers. The hor d’oeuvres and dinner featured products from major sponsor Organic Valley, as well as nearby Driftless Organics. Multiple members of the Organic Valley marketing team, including Vice President of Marketing Lewis Goldstein, as well as Josh and Therese Engel of Driftless Organics, were there to enjoy the experience at what was, arguably, the premier social event of the season in the Kickapoo Valley. Wayne and Nancy Zimmerman who run a floral design business in the southeastern United States attended the dinner. They had heard about the event from friends in the industry who had hosted one of the Field to Vase dinners in 2017. Sharon and John Carlson run a landscape architecture business in Libertyville, Illinois. They first met Star Valley Flowers owner John Zehrer at an international flower show in Shaumberg, Illinois. They have since followed the farm on Facebook, and learned about the dinner there. 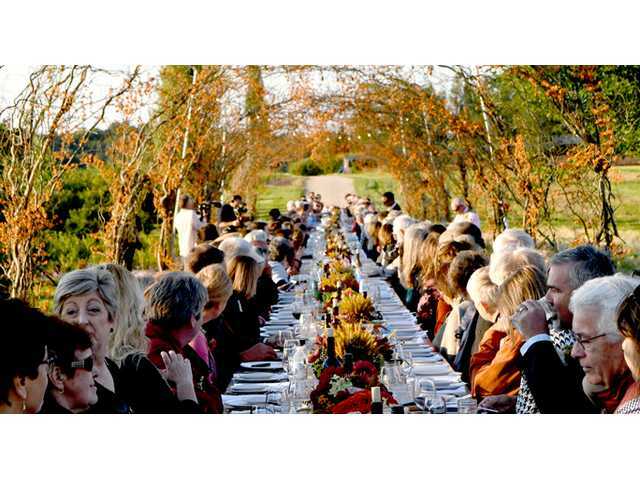 The American Grown Field to Vase Dinner Tour is a series of exquisite, intimate gatherings, that place seasonal, local and sustainable American Grown Flowers at the center of the table where locally grown food, beer and wine is served by a farm-to-table chef. Each artisan-style dinner is held at a breathtaking venue — an American flower farm that encourages guests to experience the age-old art and science of flower farming. Cronquist explained that over 80 percent of flowers sold in the U.S. are imported. Thanks to the efforts of Certified American Grown, America’s flower farmers are giving consumers confidence in the source of their flowers by providing the only third party guarantee in the floral industry that the bouquets and bunches that are purchased were actually homegrown. On any given day, Star Valley Flowers is a gorgeous place, and part of an industry dedicated to producing beauty. Never more so in the autumn, when all the plants grown for their color, texture and berries are at their glowing peak. John Zehrer’s side yard, is graced with unique species of trees and plants, and venerable, old, ivy-covered Norwegian pines. Nestled into this verdant paradise, the ears were blessed with the tripping notes of old-time music provided by Kickapoo Joy Juice. Hanging banners of colorful streamers, hand-crafted by Berta Diez Barbens, wafted gently in the cool breeze, while the dazzling floral arrangements and gentle perfumes permeated the air. The palate was delighted by a piquant selection of fruits, cheese and meats, and the taste buds cleansed and refreshed by the magnificent selection of artisanal shrubs, wines, and whiskey that flowed freely. Everywhere in evidence were smiles, laughter and gay spirits. At the pre-dinner reception, guests were treated to a bounty of locally produced hors d’oeuvres, artfully prepared and presented by Chef Luke Zahm of Viroqua’s Driftless Cafe. Organic Valley Kickapoo Blue Cheese, Uplands Cheese Company Pleasant Ridge Reserve, Kase Meister Seven-Year Cloth Bound Cheddar and La Claire Creamery Evalon delighted guests with their creamy textures, and tart and tangy taste. The dazzling and delicious array of ‘charcuterie’ or meats, arranged amongst the cheese, olives, fruits, jams and sauces, were delivered to the fete on a plank fully 12 feet in length by Zahm. House Finocchiona, Sopressata and Black Pepper Coppa sausage, produced by the Café’s own charcuterie artist, as well as Rushing Waters Smoked Trout and Spanish Anchovies rounded out the tasty selection. All of the floral delights, presented by Garden District co-owners Greg Campbell and Erick New, were produced on the farm. The floral artists from the Memphis, Tennessee, award-winning event, and personalized home and garden design company, were given free reign to create a floral masterpiece with the abundant supply of flowers available. The two designers had worked previously with John Zehrer and Star Valley Flowers to create a chapter in their book, ‘Garden District: Florists to the Field,’ about the farm. All of the flowers and almost all of the food used for the dinner were produced in the Driftless Region. For the floral arrangments, the farm supplied Bittersweet, Curly Willow, Hydrangea, Blueberry Viburnum, Crab Apple, Celosia, Zinnias, and assorted grasses. The dinner for 200 was served under a series of arches constructed from Bittersweet, Curly Willow and Hydrangea, festooned with twinkling lights. The table arrangements were a tastefully arranged selection of the other flowers grown on the farm. Chef Luke Zahm spoke to diners about the passion that motivates the work he does. Zahm congratulated the guests on their decision to attend the event. The dinner, served family-style, started with a salad of tomatoes from Deep Rooted, with mint and basil from Crave Brothers. This was topped with mozzarella, red onion, olive oil croutons and a truffle vinaigrette. Organic Prairie beef with a demi glace, herbed roasted potatoes, organic fried grit cakes from Meadowlark Organics, and a black bean and sweet corn succotash from Driftless Organics rounded out the entrée. Dessert was a late summer berry fool with Organic Valley whipped cream. Yahn explained that one of the premier producers of the finest quality foods in the area is Organic Valley/Organic Prairie. John Zehrer grew up on a farm, and has carried an ingrained work and land stewardship ethic forward into his floral farming career. Raised on a registered Holstein farm in Sauk Center, Minnesota, he originally purchased his farm intending to milk pastured Jersey cows. When working in Minneapolis to help restore a building, which housed a florist, he had the epiphany that he could derive a farming livelihood from growing flowers. In 1988, he sold his cows, and began the often joyous but backbreaking task of converting his acres from pasture and cropland to the beautiful terraced rows of flowers and fruiting shrubs visitors and passersby can see today. The farm sits at the headwaters of the Conway Creek tributary of Tainter Creek, a body of water well known for its catastrophic flash flooding. The responsible land management at Star Valley Flowers helps to hold the water in their perennially covered ridgetop soils, and reduce the amount and velocity of water running off into Conway Creek. The farm also employs many other conservation practices such as pollinator-friendly plantings of clovers, beekeeping and more. John Zehrer seemed elated, proud, and at times almost charmingly tongue tied by the many expressions of admiration and thanks for the farming business he has pioneered, and for hosting the event.